After her entanglement in financial fraud and an FBI investigation, all Gilly Harris wants is to move on with her life, run her beloved coffee shop, and pay her legal bills. She’s done with men who involve her in their shady schemes. Trouble is, those men aren’t quite through with Gilly. Marine veteran Gardner Dawson is at loose ends when an IED cuts short his tour of duty in Iraq, leaving him an amputee. A temporary gig babysitting a bookstore for his best friends helps fill the void, but even with the distraction of the provocative barista next door, he faces the prospect of a future without the career that meant everything to him. The last thing either of them wants is to team up against a con man and a dirty FBI agent, but when danger stalks Gilly, Gard’s protective instincts blaze to life–and so does his heart. Someone’s determined to learn Gilly’s secrets, maybe at the cost of her life. That’s not a price Gard is willing to pay. Not even if he has to put his own life on the line. 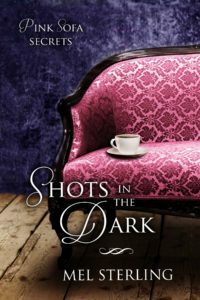 Shots in the Dark, book two of the Pink Sofa Secrets series.